2019 Fun Shows 2:00 p.m. Trail will be held outside main arena, concurrently with show. Rain Dates - Following Saturday of each monthly show. Interested in pre-entry for shows? 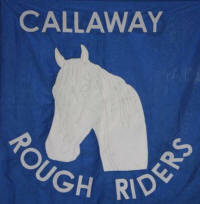 Contact callawayroughriders@ymail.com. Sign up for year end awards! Entries close 5 classes in advance. No cross entering horses in pony, stock, and non-stock classes. No cross entering horse & rider combinations in novice walk/trot and walk/trot/canter classes. Speed classes require walk through gate, no alley. Club reserves the right to add or remove classes. Negative Coggins will be checked at entry window. Club assumes no responsibility for injury, damage or loss of personal property. All dogs must be on leash. Cookshack open during show. Water, restrooms on site. Absolutely NO alcoholic beverages allowed on Rough Riders property. Cookshack open during show. Water, restrooms on site. Absolutely NO alcoholic beverages allowed on Rough Riders property. Directions: Hwy 54 to State Road H exit. 8/10 mile on Rt. H. Right on Tilla Drive.